While most of our customers are used to seeing us in warmer weather, L.I. Elite Lawncare also provides you with snow removal service during the winter months. We can give you the peace of mind of knowing that when the white stuff comes down, you’re going to be able to get out of the driveway and on the road to work the next morning. L.I. Elite Lawncare is available to do snow removal in the areas of western Suffolk County where we normally serve for our lawn maintenance customers. We do residential and commercial snow removal jobs as well, if you own a business and have a lot that needs to be cleared, talk to us. Much of our snow removal business is residential and we handle our jobs on a case by case basis. 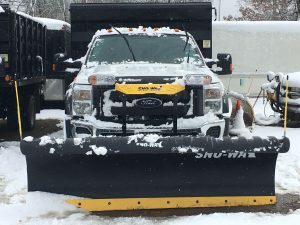 We won’t charge blizzard prices when there are only a few inches of snow on the ground and we won’t demand you sign a snow removal contract at the beginning of winter for a set price before you know if it’s even going to snow or not. Contact us when you know a storm is coming and we’ll set a fair and reasonable price. Once the storm has ended, we’ll come to your home and clear your driveway. If you need sidewalks or pathways clear or snow removal done elsewhere on your property, let us know and we’ll be able to get that taken care of as well. If there’s a particularly heavy snow falling we may come twice to expedite clearing. L.I. Elite Lawncare prides itself on communication with our clients and if you have special needs regarding snow removal, we’ll do our best to accommodate. L.I. Elite Lawncare can help dig you out from the storm and the price we charge won’t bury you either. Contact L.I. Elite Lawncare or give us a call at (631) 277-1111, we’ll do the job professionally, and we’ll get you back to normal quickly.